From the carpark in Narai we crossed the train crossing entering the outskirts of the Kyoto side of the post town. To begin with we headed to Shizume Shrine on the edge of the Kyoto side. Just like it is reported travelers from long ago did, we looked back at the village from the side of the mountain. They must have been relieved after safely crossing the mountain range and arriving at Narai-juku. Sitting between two mountains red with autumn leaves the village looked beautiful. 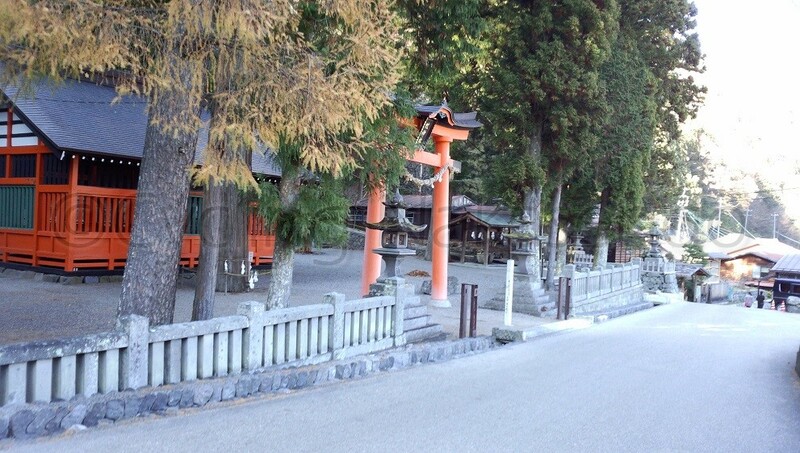 Narai-juku is situated at one of the highest altitudes of any town along the Kisoji. The town runs from the Kyoto side of Shizume Shrine at the top of Torii Toge and down along the bank of Narai River for about 1km. It was the longest of the post towns. In the past many travelers waiting to cross Torii Toge’s mountain pass stayed in what was known as “the thousand houses of Narai”, an area along the Kisoji known to be particularly lively. 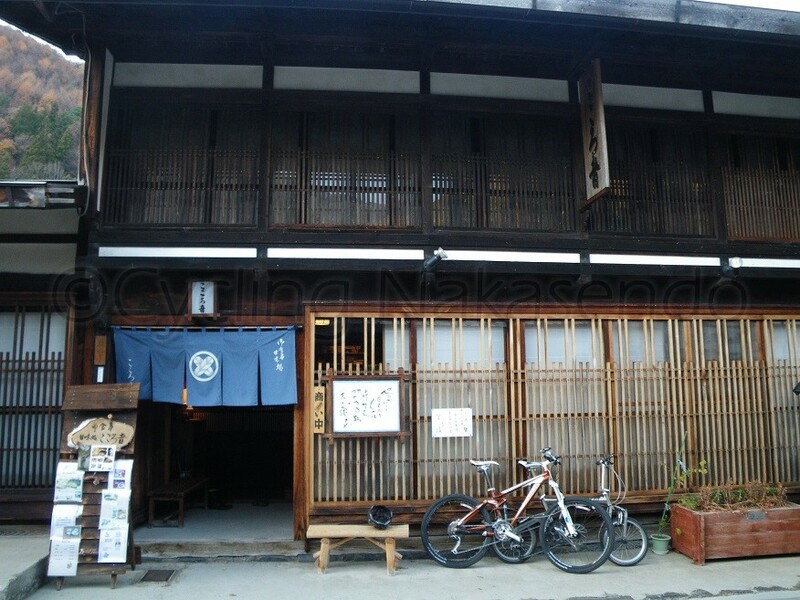 There are a lot of buildings dating back to the Edo era that have been conserved and restored. Like Tsumago and Otsumago the area has been listed a Nationally Designated Architectural Preservation Site. That there haven’t been any large fires since then is probably one reason for the large number of traditional buildings in this area. As we left Shizume Shrine and began to gently descend down the mountain and head towards Edo we passed a water fountain where water directed from the mountains could be accessed, an old sign, and peered into the windows of the first souvenir store we had seen since entering the traditional town. After passing through about one third of the town we hit a masugata. As we reached a wide road in the center of the town, the number of tourists suddenly increased. 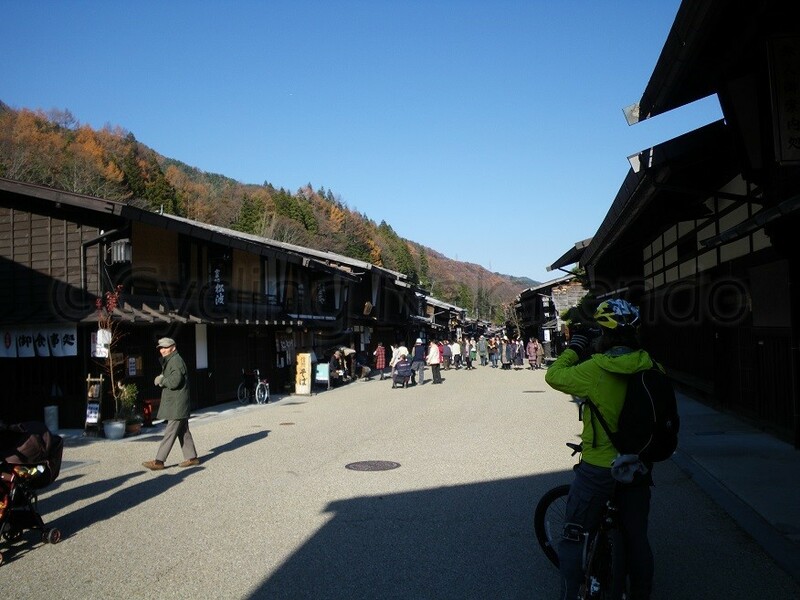 It wasn’t as crowded as it had been in Magome or Tsumago though. There was just the perfect number of tourists to allow for leisurely sightseeing; not too many and not so few that it felt empty- just enough that it felt lively. Businesses are still operated in the traditional buildings. We saw, eateries, soba shops, dango (Japanese confectionary made from sticky rice) shops and souvenir stores. Apart from the hairstyles and clothing of the customers it looked as if time had not changed anything. 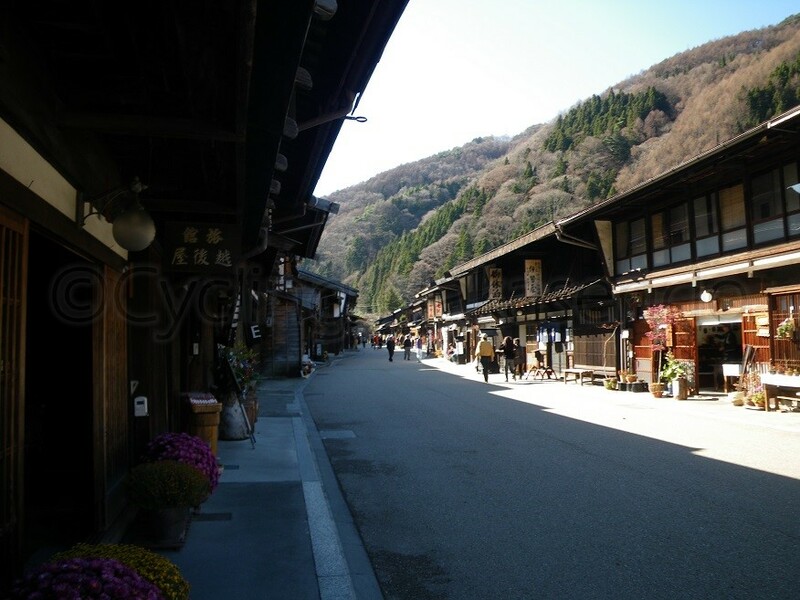 During the Edo period there was a depot for luggage being transported along Nakasendo on this wide road in the center of the town. No doubt it would have been a hub of activity with horses, oxen and a wide variety of goods. The inn Iseya, which still stands in center of the town was originally run as a subsidiary of a depot and eventually ran solely as an inn in 1818. There is also a ryokan, Echigoya, which has been in operation for 220 years and is now the only ryokan that is still in operation in the area. As was the case during the Edo era Echigoya only has two rooms, so even if you would like to stay there it is often difficult to succeed in booking a room. In 1793 a sake brewery was established (not currently producing alcohol and other beverages) that has been selling goods produced in Narai such as functional objects made from Hinoki and lacquer-ware since the Edo era. The post town atmosphere of Narai is still alive and well. We left the center of the town and headed towards a place I always stay at in Narai, called Ikariya Machida Minshuku. We passed by its front, which is distinctive due to its narrow façade and a doorway that you couldn’t pass the handles of a bike through. Nearby an electrical goods store is run from a traditional building with a retro sign out the front. The effective use of something old in a way that is contemporary has created a good atmosphere. There are very few convenience stores along Kisoji, so places that supply batteries and other electrical goods are highly valued. 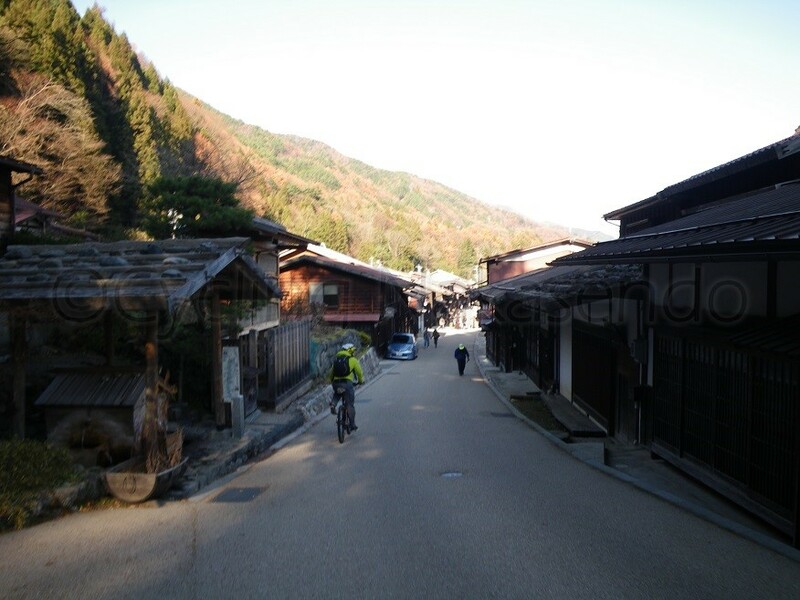 While we had enough batteries, we were both drained after the bear panic and needed to attend to our body’s energy reserves so we decided to look for somewhere to eat when we realized we had ridden to the edge of the Edo side of the town. We headed back into the center of town. Depending on the eatery some places would only be open for lunch hours so we couldn’t afford to be fussy. We were lucky that the restaurant, Kokorone, was open. We parked our bikes in front of the shop’s latticed windows and went inside. Kokorone operated in a traditional Japanese house. As soon as we sat down on cushions on the tatami-mat floor, any tension left our bodies and was quickly replaced with exhaustion. We took our time deciding what to get from the menu. NC decided on the local delicacy, Toji soba and I chose cold soba with tempura. Toji soba is a way of eating warm soba that was developed in extremely cold parts of the region. Small helpings of soba are served placed into bamboo baskets. The consumer of the soba blanches it by dipping the basket into a pot of simmering warm soup of seasonal vegetables and mushrooms before eating it. In colder months, this ingenious way of eating the soba allows the delicious warm soup ingested with the soba to warm the body and heart. Of course my Tempura soba was also good. My body must have been craving an energy boost as the crisp fried outer shell of the tempura combined and taste of oil was unbelievably delicious. There was next to no conversation as we concentrated on the task of eating. After finishing I was overcome with the strong desire to curl up and go to sleep. However, it was already past three so within minutes of finishing our meal we left our seats to continue our journey.